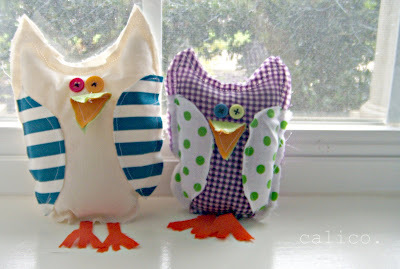 Dani and her cousin Camryn decided they wanted to make owls. So they did some designing, and walla...owls. I love them. Then the boys decided they needed owls. Walla, walla, walla. more owls. Poor Scooter there on the end kept running into walls and "slapping his brain silly" until Andy figured out the poor bird needed glasses. His swooping skills have improved considerably. Andy is still concerned, however, with Scooter's lack of pants. 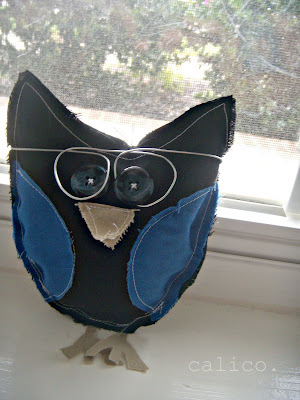 That looks like the were a hoot to make! Sorry I couldn't resist. They are so cute. 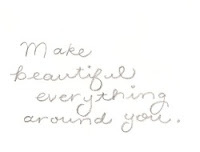 I linked to this post on my blog as an inspiration. I am all about the owls! I love em! yours are too cute of course! oh those are ridiculously cute! I am never going to let my boys look at your blog. They would never appreciate me giving them glue sticks, ribbon, and paper with a "get crafty" again. Love them!!!!!!!!!!!!!!!! I need a few owls in my house. Are you still doing quiet books??? I need one of those too!!! I love owls! Your kids are so funny. send the cousins over here to make me a herd. a herd? what is a group of owls called? Fun, but I bet you had a mess!!!! does andy name everything scooter??? You got a good chuckle from Abigail who was looking over my shoulder...she loved the glasses. Tell Andy that owls can't wear pants...they wouldn't be able to get off the ground...silly Andy. 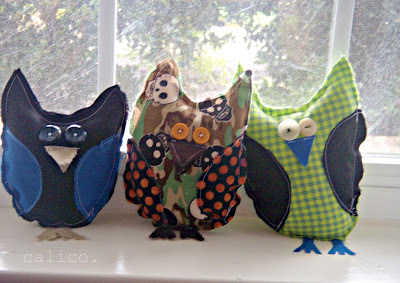 I don't believe that your boys made those owls all by themselves. Uh, no Alice. They picked the fabrics and the buttons and tried to get creative in the placement of the wings and such, but as hard as they tried to be different, they all ended up pretty much the same. Scooter is now on vacation in Aruba, where they don't need pants.